Split, "najlipši grad na svitu" (meaning as the locals would say: "the most beautiful town in the world"), isn't just interesting to its visitors during the summer. Throughout the year, from winter until summer, this gorgeous coastal town offers rich entertainment and various cultural and gastronomic events to its visitors. Visit Split off season, experience the authentic "Split way of life" and take part in various interesting events. Spring is the time of the year when everything wakes up, even Split. With the arrival of warmer and sunnier days, people crawl out of closed spaces, get out of their winter coats and slip into lighter clothes, spend as much time as possible on the famous seafront, the Riva, and other coffee shops in the open, sipping coffee. On weekends people like to hike on Marjan, while the braver ones salute first days of spring by taking a dip in the city's beaches. For those among you who are hungry for adventure, spring is the ideal time of the year for an outing in nature. You can hike on the mountain Mosor or the surrounding hills Kozjak and Perun. So arm yourself with your mountaineering equipment and plenty of water! 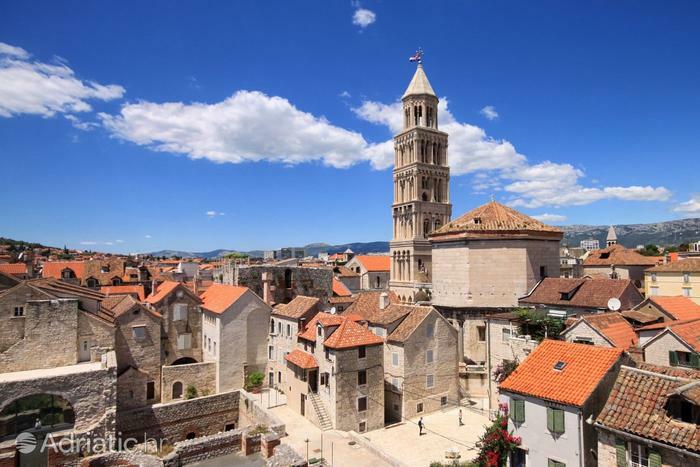 When back in Split's center, don't miss out on various manifestations like the Holiday of flowers which occurs during May in Diocletian's basements or the Vine fair, also taking place in the basements. For a whiff of tradition, in the very centre of Split, each year on May 7th, experience how the locals celebrate Day of the city, more widely known as sv. Duje. St. Duje is the patron saint of Split. He was one of the Christian martyrs during emperor Diocletian's reign. Every year, the city of Split makes a big effort to organize a rich program for the day of its patron saint. The celebration begins with a procession which starts from st. Duje's cathedral, to Riva and all the way to the altar on Franjo Tuđman square. After the mass, it's time to get the party started! Taste some delicious traditional dishes in the local fishmarket, populary known as Peškarija. After that, take a stroll to the nearby Riva and check out some authentic Croatian products on the fair. The most popular ones are wooden and woolen products for people of all ages, so there isn't a housewife who doesn't buy herself a wooden ladle on that very day. In the afternoon hours, be sure not to miss the Split tombola on Riva, and especially don't miss out on the concert in the evening, which usually ends with a spectacular firework. During spring, on the open market populary known as Pazar, right next to the Palace's walls, enjoy the inviting colors of seasonal fruits and vegetables, all organically farmed. We recommend artichokes and wild asparagus which you can handpick yourself on the slopes of Marjan from March until May. It comes as no surprise that summer in Split is a period with the richest tourist offer. Visitors of all profiles, from partygoers to cultureholics, will find something for themselves. Film enthusiasts will find interesting the Mediterranean Film Festival, a popular manifestation which, every June for these last nine years, offers a unique movie experience. The festival is special for premiering films from mediterranean countries, most of which are not available in the usual cinema distribution. Most of these film screenings are held in the open summer cinema on Bačvice beach. Surrounded by the rustle of the sea, the scent of pinetrees and popcorns, enjoy some of the best movies of world cinema. It's so popular that lots of vacations are planned exactly for that time period. On the first day of summer, Split celebrates World music day. With this manifestation, Split joins a long line of other countries which want to indicate the importance of music in everyday life. Entrance to all concerts, some of which are dispersed throughout the city centre, is free of charge. In June, there is also a local festivity called Dani Radunice (Days of Radunica), one of Split's oldest neighborhoods which, with its narrow and stony little streets enchants both locals and foreign guests. Join the locals for a klape song, wine with fish and enjoy the unforgettable atmosphere of old Split up until the early morning hours. July is packed with music festivals, from the partygoer's favorite destination - Ultra Europe, San Sustipanske noći (Sustipan night dream), Etnoambient Salona, to one of the most visited international - scenic manifestations - Splitsko ljeto (The Split Summer). Clear blue sea, beautiful sandy (Bačvice and Firule) and pebble (Kašjuni, Ovčice and Žnjan) beaches, together with high temperatures, are the perfect background for one of the biggest electronic music festivals in Europe - Ultra Europe. The festival takes place every year in the middle of July on Split's city stadium Poljud. After Poljud, Ultra moves to the divine islands of Brač, Hvar and Vis where you can enjoy the biggest world hits while sipping coctails. If, at the beginning of July, with the arrival of evening and cooler temperatures you wonder where you can spend the evening, drop by to Sustipan, a little peninsula pretty close to the city centre, with a beautiful view of Split. Sustipan Night Dream Festival takes place there. Sit on your blankets under the stars and pine treees, enjoy some of the most special musical treats from the best Croatian and foreign musicians. However, not all events are in Split! In July, head to ancient Salona near the city of Solin and visit the Etnoambient Festival of etno music where, for two nights, you can enjoy the enchanting sounds of traditional music in an ancient atmosphere. The culmination of the summer cultural offer in Split is represented by the Splitsko ljeto (Split Summer), a month long manifestation. It includes the opera, drama, ballet, exibitions and classical music concerts. The authenticity of performance is enhanced by the fact that most of them are held in the open, historical sites like Peristil, Sustipan and the basements of Diocletian's palace. If you're wondering how Italian operas sound like in the open, be sure to attend this cultural event par exellence. Dog lovers will enjoy the 4 summer night dog exibitions which take place at the end of July. In August, be prepared for a whiff of the past. During Days of Diocletian, dedicated to the legendary Roman emperor who built his palace in the city's centre, you have a chance to have a taste of ancient Roman history, the era of roman legionnaires, gladiators and togas. You can try some ancient specialties in Diocletian's basements or you can be a part of gladiator fights and cheer for you favorite. If you want to sightsee the city's historical core, keep in mind that during Splitsko ljeto, that part of the town is full of stages for the festival's manifestations, so you can't walk through some streets at all during the day. That is actually better for you because it's not recommended to be in the sun for too long in the summer. Use the day for a dip at some of the city's beaches where you can hide under the shade of parasols and trees, while you plan the sightseeing for the evening.